Just last month, Pennsylvania asked federal officials to designate Pennsylvania as a “proving ground” for autonomous cars. The request comes at the heels of groundbreaking research of autonomous cars from Carnegie Mellon University. With such technological advancement, however, comes the need for upgraded legislature. Pennsylvania’s Department of Transportation (PennDOT) has recognized the need for such legislature and formed a task force to develop these policies. KBG personal injury and wrongful death attorney Timothy Salvatore has been following the task force’s endeavors, so we asked him a few questions about what legislature for autonomous cars could look like in the future. Where do we begin with this discussion? That’s actually one of the biggest issues. Let’s start by setting the stage for who are the key players in the discussion, what are their agendas, and what is the current state of affairs. I would also like to share my thoughts about how we should balance the competing interests. I suppose that we should start by defining what we mean by autonomous vehicles. There are technologies that augment human driving, like lane assist, emergency braking, cruise control, stability assist, and others, but don’t replace the human operator. In general, these technologies are not what we’re referring to as autonomous vehicles; they’re automated, not autonomous. There are technologies that replace the human driver under certain circumstances, like the system in use by Tesla and others that can manage stop-and-go traffic or highway driving with the human driver required to remain immediately available to resume full control. These are generally referred to as highly-automated vehicles (HAVs). Then there are the fully automated driving systems (ADSs) that completely replace human operators. (Fully-automated vehicle (FAV) would be a better term.) Google’s pod-like vehicle, devoid of controls for a human operator, comes to mind in this class. The rest of our discussion will focus on HAVs and ADSs. It’s the replacement of the human operator that is at the heart of all discussions about autonomous vehicles. Who are the key players trying to get autonomous vehicles on the road and regulate them? The Commonwealth and the Federal governments (acting through their administrative agencies and departments, namely the Federal Highway Administration, National Highway Transportation Agency, and Departments of Transportation) are the two biggest parties to the discussion about the future of autonomous cars. But private organizations that deal with vehicle safety and transportation, such as AAA, American and Pennsylvania Associations of Justice (trial lawyers), Insurance Institute for Highway Safety, and others are involved in the discussion, lobbying on behalf of their interests and the interests of others. The other competing interests come from the commercial entities that stand to profit from the technology — the manufacturers, like Ford, GM, and Tesla, businesses like Uber, whose services will use autonomous vehicles, and universities, like Carnegie Mellon, that are involved in engineering and design of autonomous vehicles. What are key players’ agendas? Providing for public safety and fostering commercial opportunity are the primary concerns of the federal and state agencies. Creating profit potential, including maintaining regulatory stability and limiting liability, are the primary concerns of the “for profit” entities involved in the discussion, specifically the manufacturers, transportation service providers, and insurers of those entities. Promoting research and development and courting prestige in their fields are the primary focus of the educational organizations involved in the discussion. Public safety is the goal of the public interest and consumer protection groups involved in the discussion, including groups like I belong to, the Associations of Justice, that stand up for persons who suffer harm when the technology fails. Are autonomous vehicles permitted on Pennsylvania roads? Are they regulated? You can review the Pennsylvania Autonomous Vehicle Testing Policy: Final Draft Report of the Autonomous Vehicle Policy Task Force published on November 2, 2016, for additional details. What does the future hold for the use of ADSs and HAVs in Pennsylvania? They’re coming to Pennsylvania’s roads, and soon. Pennsylvania is trying to be on the forefront of HAVs and ADSs usage. We’ll see subtle changes in the near future with the augmentation of human drivers with such features as lane assist, driver alert warnings, emergency braking, pre-collision warnings …, things that help humans be safer while operating vehicles but that don’t replace human operators. Those technologies are readily available now and becoming more widespread. But, it’s the replacement of the human driver that will drastically change the landscape for manufacturers, insurers and owners. We’re just decades away from such drastic changes. With the life cycle of vehicles being what they are, I estimate that within two decades the majority of vehicles on the road will be HAVs and another decade thereafter, a significant number of vehicles on the roads will be ADSs. It really is an exciting time. The technology is developing rapidly. HAVs and ADSs are a huge commercial opportunity and will affect significant social change. They will preserve the independence of our elderly and disabled citizens. The operational efficiency and safety of the automated vehicles has the potential to drastically reduce the effect of human error. They stand to make automobile travel safer. What are your biggest concerns about the automation of driving tasks? While the automation systems stand to make cars safer, they will still be involved in collisions and people will get hurt. There are very few true accidents. The vast majority of collisions happen because a driver did something wrong. Who is the driver thus becomes the fundamental question. The answer could drastically change how we assess responsibility for causing accidents. Consider how the current system works in a simple vehicular collision case. Driver B drives into Driver A in an intersection. Driver A is injured and believes that Driver B is at fault for causing the collision and his injuries. In order to collect compensation for his injuries, Driver A must prove that Driver B didn’t do something that a reasonable person would have done or did something that a reasonable person would not have done. In addition to presenting his own testimony, the testimony of witnesses, videos of the collision …, Driver A can also cross-examine Driver B. Driver B can cross-examine witnesses and Driver A in defense of the claims against him. If the vehicle was running in autonomous mode at the time of the collision, was Driver B the operator or was it the automation system? 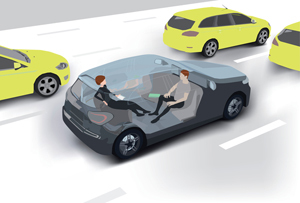 If the vehicle was in autonomous mode, does Driver B remain responsible for safe operation of the vehicle? Does Driver A need to sue both Driver B and anyone responsible for design, manufacture and maintenance of the vehicle? Who has responsibility to prove that the automated system was or wasn’t working properly? Will there be any witnesses to a collision other than the data recording systems on the vehicles? As an advocate for injured persons, I’m concerned that more barriers will be erected between the injured persons and the compensation that they deserve when harmed through no fault of their own. Placing responsibility for proving that an automated system failed on an injured party is inherently unfair. Proving that an automation malfunction due to manufacturing or design defects is a complicated, technical undertaking. Injured parties would no longer be up against just the insurance company attorneys who represent the at-fault parties, but also attorneys for the manufacturers and designers and their teams of experts. What would otherwise be a simple negligence claim could easily turn into a complex products liability claim. The cost of pursuing a claim could be prohibitive. Every case could end up being litigated. There are no easy solutions to these issues. The recommended policies from the task force are a good start. I hope that rules are put into place to shift the burden of proving that a vehicle control system malfunctioned from the persons injured through the operation of autonomous vehicles onto the manufacturers and designers of the autonomous vehicles to prove that the vehicles did not malfunction. In essence, creating a rebuttable presumption that the autonomous vehicle malfunction. But, I won’t be holding my breath awaiting such consumer-oriented solutions. If you think you may have a personal injury or wrongful death claim, contact KBG Injury Law’s Timothy Salvatore. KBG will fight to get you the Results You Deserve®.